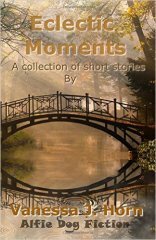 Eclectic Moments, a collection of twenty-two stories, investigates how ordinary individuals handle the often extraordinary dilemmas at pivotal points in their lives. Many of these stories are fictionalised versions of real life events. As you read, ask yourself the question: How would you react? Vanessa Horn – since becoming interested in writing during a sabbatical year from teaching, Vanessa has written several hundred stories, some of which have been published in magazines, and others having won prizes in short story competitions. She enjoys reading, playing music, shopping and going out for meals. Amazon: 5* - Some make you laugh, some make you cry but they all leave you thinking and pondering. An extremely enjoyable read - highly recommended. An excellent collection of entertaining short stories. Vanessa's writing flows at a rapid, descriptive clip. An extremely enjoyable journey through the time of our lives. From reading the first story 'What's in a name' from the extract of the book, I enjoyed the style which puts me in mind of my favourite Terry Pratchett stories. Now I want to read more. An interesting range of stories providing a fascinating read.